1672: his name appears for the first time in the Kabuki records, as a disciple of Murayama Heiemon II, who performs with his master in Kyôto. 3rd lunar month of 1685: Heijûrô goes to Edo and performs at the Ichimuraza. 1688: Heijûrô goes back to Ôsaka. 11th lunar month of 1689: Heijûrô plays in Ôsaka in the drama "Fujiwara no Haruhime", which is produced by Iwai Hanshirô I. His stage partners are Nakagawa Kinnojô and Uemura Kichiya II. 1st lunar month of 1690: Heijûrô plays in Ôsaka in the drama "Sakaba no Ôji", which is produced by Iwai Hanshirô I. 3rd lunar month of 1693: Heijûrô plays in Ôsaka in Chikamatsu Monzaemon's drama "Butsumo Mayasan Kaichô", which is produced by Iwai Hanshirô I and stars along with Heijûrô the actors Sugiyama Kanzaemon I and Iwai Sagenta I; this production is a success and a long run (150 days). The same play is simultaneously staged in Kyôto at Miyako Mandayû's theater. 1694: Heijûrô becomes zamoto and produces in Ôsaka the drama "Wakoku Fûryû Kyôdai Kagami", in which he plays the role of Soga Gorô Tokimune. His stage partners are Takeshima Kôzaemon I (Soga Jûrô Sukenari), Nishikawa Okanosuke (Jûrô's lover Ôiso no Tora) and Hayama Heiemon (the Soga brothers' mother). 11th lunar month of 1695: Heijûrô goes to Edo and performs at the Moritaza. 26th day of the 12th lunar month of 1695: a fire breaks out in the district of Sukiyabashi, which burns the Moritaza to the ground. 1st lunar month of 1696: Heijûrô plays at the Yamamuraza the role of Fuwa Banzaemon in the drama "Fuwa Nagoya Uikamuri"; the role of Nagoya Sanza, Banzaemon's rival in love, is played by Nakamura Shichisaburô I. Winter 1698/1699: Heijûrô goes back to Ôsaka. 1st lunar month of 1699: Heijûrô's rank in the Ôsaka hyôbanki is jô (superior). He plays in Ôsaka in Tsuuchi Jihê I's drama "Taisanji Yakushi no Kaichô", which is produced by Iwai Hanshirô I. 4th lunar month of 1699: Heijûrô plays in the same theater the role of Taira no Masakado in the drama "Ryûjo Tsuya Oshiroi", which is produced by Iwai Hanshirô II; the role of Masakado's enemy Tawara no Tôta is played by Sakurayama Shôzaemon I. 1st lunar month of 1700: Heijûrô plays the role of Moriya no Daijin in the drama "Onna Chôteki Sangoku Denraiki", which is produced in Ôsaka at the Kita-Horie Ichi-no-Gawa Shibai (Ôsaka) by Araki Yojibê I. 1st lunar month of 1701: Heijûrô plays in Ôsaka the role of Tawara Magosaburô in the drama "Keisei Tamazusa no Miei", which is produced by Arashi San'emon II. 3rd lunar month of 1701: Heijûrô's rank in the Ôsaka hyôbanki, tachiyaku section, is jô-jô (superior - superior). 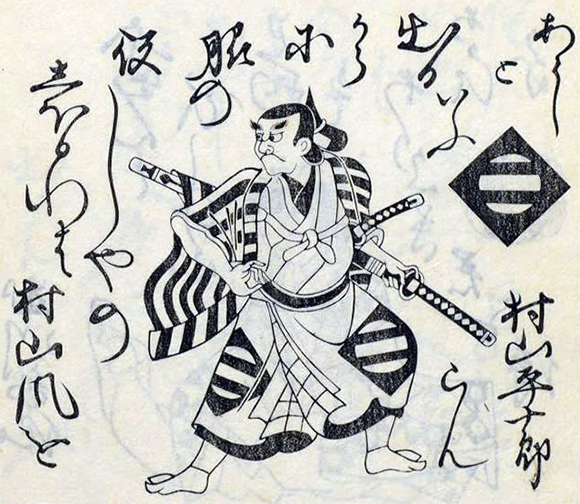 Fall 1701: Heijûrô plays in Ôsaka the role of Mochizuki Jûrozaemon in the drama "Nagori no Sakazuki", which is produced by Arashi San'emon II. 1st lunar month of 1704: Heijûrô plays in Ôsaka the role of Abe no Munetô in the drama "Azuma Mondô", which is produced by Kataoka Nizaemon I, who plays the role of Munetô's brother Sadatô. 11th lunar month of 1704: Heijûrô becomes zamoto in Ôsaka. 1st lunar month of 1705: Heijûrô produces in Ôsaka the new year drama "Miura no Ôsuke Hyakuhaimaru". 2nd lunar month of 1705: Heijûrô's rank in the Ôsaka hyôbanki is jô (superior). 2nd lunar month of 1706: Heijûrô produces in Ôsaka the drama "Washi no Oyama Kaichô". Fall 1706: Heijûrô goes to Kyôto. 11th lunar month of 1706: Heijûrô performs at Kameya Kumenojô's theater. 3rd lunar month of 1707: Heijûrô's rank in the Kyôto hyôbanki, tachiyaku section, is jô-jô (superior - superior). 8th lunar month of 1707: he is supposed to go to Edo with Murayama Heiemon III and receives 50 ryô for the trip. He suddenly dies and his son Murayama Kinjûrô (the future Murayama Heijûrô II) replaces him. Murayama Heijûrô I was a good tachiyaku actor, who was active from the 1670s to the 1700s. He was more a katakiyaku in his prime but definitively switched to tachiyaku roles in 1699. He was said to be better in jidaimono than in sewamono and was endowed with a powerful voice.